When Chattanooga went public last week and began selling shares of its club, the reaction of the internet was inspiring to fans of the lower league. Quickly the amount was over 100k, then 200k, and, as of the time of writing this, almost to half a million. The idea of fan ownership isn’t entirely brand new to the world of American soccer, but it is certainly an idea that seems to be gaining ground. The success of CFC’s drive would indicate that it can work and that there is fan interest in the idea. Far removed from Chattanooga is Gold Coast Inter AFC in West Palm Beach, FL. The connection to Chattanooga is the fan-owned aspect of the club. The team is owned by players and fans through an Inter Community Trust. Fans from all over the country, as far away as Boston and San Francisco, purchased shares and voting rights within the organization. The club formed in the summer of 2017 and GCI spent a season in a competitive recreational league, Beaches Adult Soccer League, winning both the league title and the cup. Looking for more imposing competition, the club decided that a change needed to happen. The players and fans voted to join the UPSL. In their first season in the league, the team qualified for the playoffs, showing they were ready for challenge of the national league. The stellar performance of the club on the pitch is only matched by their kits and crest. The name and colors of the club were chosen with input from the trust and fans. Christian Franek, club manager for Gold Coast Inter discussed why each color was chosen. “Gold for the obvious Gold Coast reference, which is the nickname for the Florida coast from Palm Beach County down to Miami-Dade County, due to its relative affluence. The hunter green is likewise symbolic of the lush tropical surroundings that were influential in attracting railroad tycoon Henry Flagler ( and his well-heeled friends) and development to the area, making Palm Beach what is today.” The crest was designed by Robert Boyd, part of the very popular design team at We Are Custom FC. Franek assumes that Boyd was inspired by several European clubs in his use of overlaying letters in the crest. The crest has an implication of wealth and class, like the Gucci brand logo. Everything has a place, but the flow of the design is what stands out. The eyes naturally trace the curvature of the letters - it’s beautiful. Boyd also designed the original kit for the club, but it wasn’t until Robby from Icarus FC (also a sponsor for this column) offered a redesign that the current kits came to life. His attention to detail and focused, tentative customer service gave birth to some of the coolest kits in the lower leagues. Icarus FC also designed the badge for Gold Coast’s recreational and developmental teams, The Breakers FC. The variety between the three kits is also a highlight of the level of expression on display. The gold kit (home), with green piping, features the crest in a print design that covers the entire shirt almost like a designer handbag or trench coat. The left chest area has a simplified version of the crest which streamlines the impact against the background print. The green kit (away) features an inverse to the gold kit, with the green background sporting the crest with gold piping on the arms and neck. Unlike the button collar of the home kit, the away has a v-neck style opening. Another differentiation is a pair of dark green lines up the body of the kit, much like racing stripes. The third kit (alternate) features a unique baseball stripe print of gold lines over a white background. The full roundel crest decorates the chest and the collar is a simple crew neck. The three kits shine for their creativity and individuality, especially in a sport that often settles for overly simplistic kit design to save cash. 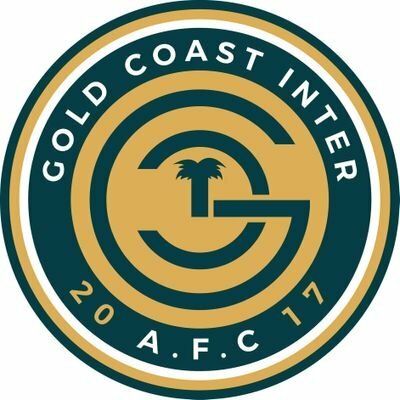 Gold Coast Inter AFC has not one, but three beautiful kits that would stand out in a crowd. If fan ownership is what drives fans to support clubs, then Gold Coast Inter AFC should have crowds at every match. If level of play gets butts in the seats, then their matches should be packed. But if a slick kit with genius design elements is what brings eyes, than Gold Coast should be the club that all lower league fans should be supporting. If you want to purchase one of their kits, the Gold Coast Shop is here. It’s a double bonus - support a club driven by fan and player ownership, get one of the freshest kits in the lower leagues. If you want to support the club and their goal of funding their upcoming season, you can also donate through Venmo or paypal. $100 gets you a year of fan ownership, $1,000 gets you a lifetime ownership stake. But even small donations go the general fund to drive this little club from Florida to success.